Committee of the Whole is the entire membership of the House sitting as a committee. 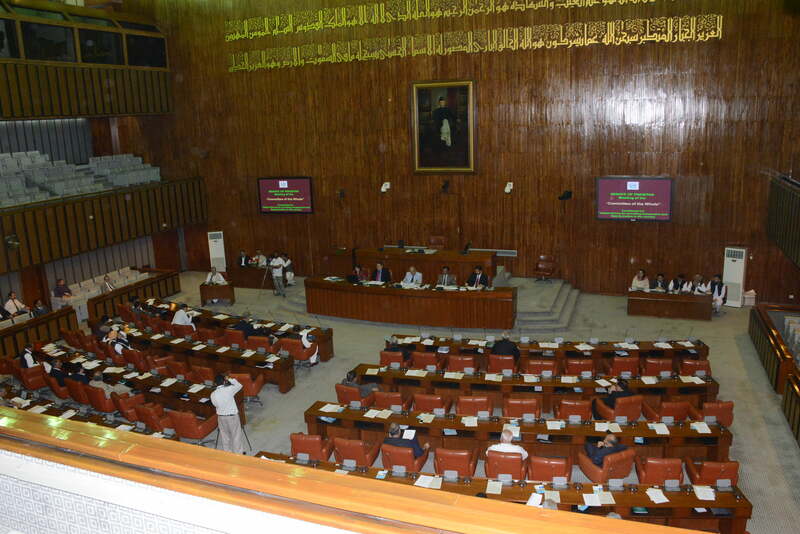 Recently, Senate Rules have been amended to provide for conversion of the House into Committee (Committee of the Whole House), on issues of National importance, with the power to require the attendance of any person or summon production of papers, record from any Division, department, autonomous body, semiautonomous body or organization, or examine such persons on oath or solemn affirmation, or invite or summon any person to give evidence in relation to any matter under its consideration. During the Senate Sitting held on 18th May, 2015, the House referred a matter regarding “steps/reforms for providing inexpensive and speedy justice in the country” to the Committee of the whole House. Accordingly, in the Senate sitting held on 19th May, 2015, on a motion moved by Senator Raja Muhammad Zafar ul Haq, Leader of the House, the House was constituted into a Committee to consider the matter referred by the House. First meeting of the Committee was held on 20th May, wherein the Committee finalized list of stakeholders for inviting input regarding the matter. Next meeting is likely to be held after Eid-ul-Fitr. The House may constitute itself into a Committee of the Whole on a motion by the Leader of the House or Leader of the Opposition, as the case may be. When the House constitutes itself into a Committee of the Whole, it functions as one Committee acting upon any matter(s) referred by the House and conducts its proceedings like a regular Committee with its membership composed of all the members of the House: Provided that if a motion to constitute the House into a Committee of the Whole is not passed, a similar motion shall not be presented within the same session. (1) The Chairman or any member nominated by the Chairman shall preside over the Committee. (2)	The Committee shall conduct business only when there is a quorum. If there is no quorum, the Chairman or the person nominated by the Chairman to preside shall immediately suspend its proceedings. (3)	In addition to his vote as a member, the Chairman or the person nominated by the Chairman to preside shall, in the event of equality of votes, have a casting vote. (4)	Documents and papers in possession of the House or the Senate Secretariat may be called for by any member and read by the Secretary Senate for the information of the Committee unless the Committee orders otherwise. Resource persons and/or technical assistants may be invited to attend the proceedings, and upon permission of the Chairman, may directly answer questions asked and inquiries made by the members. (5)	When a Committee of the whole has concluded consideration of a matter referred to it, the Leader of the House or the Leader of the Opposition, as the case may be, shall make a report to the House. Matters reported shall be presented before the House for action as though reported by any other Committee.